I’m Joe Kinan. On February 20th, 2003 while enjoying a rock concert with a girlfriend, Karla, at the Station nightclub in Rhode Island a special effects malfunction caused a fire to break out. Pyro-techniques on the stage ignited a curtain, and then instantly engulfed the ceiling and walls. The club had been sound proofed using petroleum based foam which was highly flammable. The nightclub was way over capacity. Realizing quickly what was going on I made my way from near the front row to the nearest exit. In an effort to protect Karla, I placed my leather vest over her. Everyone quickly stampeded to the doors causing a wave of people pushing each other down and trampling one another. As we made it towards the exit people fell in front of me and then on top of me. Karla suffocated and did not survive, but she was not burned. I was trapped and conscious throughout the entire ordeal. I could hear everything going on around me. The sounds of yelling were quite loud. Then it grew quieter and quieter. Then it was just me. Next I heard the voice of a firefighter, "we’ve got one over here." I was placed on a stretcher and rushed to the nearest hospital. Once I awoke from my coma I immediately understood and accepted what was going on. I spent the next 50 weeks in the hospital. Even after I was released for a few weeks, at the end of the day I would feel as if I needed to go home to the hospital. To this day it is one of the most comfortable and relaxing places for me. To date I have had 122 tune-ups (surgeries) and counting. I will continue to have surgeries for the rest of my life. This experience has taught me I am a tenacious individual and I persevere each day. I am building this website as an outlet to create awareness and let people know that it is possible to have everything you are familiar with and take for granted change in an instance. I have had to re-learn and figure out almost everything. When I think back on my definition of a bad day prior to the catastrophe I realize how much we all take for granted. 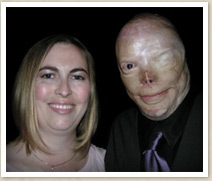 I would like to raise understanding and compassion for burn survivors like myself. If you would like to help support this cause, donate using the link below.